Salvation is saving man from the consequences of sin; especially, deliverance from sin and eternal death through the atonement of Jesus Christ. Salvation is the need of every human heart, “for all have sinned, and come short of the glory of God” Romans 3:23. 1. What is the only way we can be saved? Be it known unto you all, and to all the people of Israel, that by the name of _____ _____ …Neither is there salvation in any other: for there is _____ _____ name under heaven given among men, whereby we must be saved. (Acts 4:10, 12). 2. Can we save ourselves? For by grace are ye saved through faith; and that not of ____________: it is the gift of God” (Ephesians 2:8). “But we are all as an unclean thing, and all our righteousnesses are as ______ rags” (Isaiah 64:6). “For all have sinned, and come ______ of the glory of God” (Romans 3:23). “For without me (Jesus) ye can do nothing” (John 15:5). 3. Why does God want to save us? “Since thou wast precious in my sight, thou hast been honourable, and I have _____ thee” (Isaiah 43:4). “I have ______ thee with an everlasting love: therefore with lovingkindness have I drawn thee” (Jeremiah 31:3). 4. How has God demonstrated His Love? “In this was manifested the love of God toward us, because that God _____ his only begotten ____ into the world, that we might live through him. (1 John 4:9). 5. But I’m a sinner! Can He save me? “But God commendeth his love toward us, in that, ________ we were yet __________, Christ died for us (Romans 5:8). 6. How can I be saved? 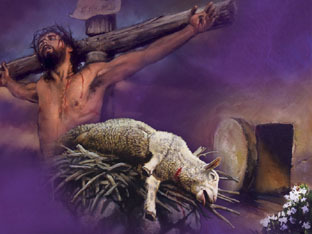 Obey -- “He became the author of eternal salvation unto all them that _______ him” (Heb. 5:9). Confess – “If we __________ our sins, he is faithful and just to forgive us our sins” (1 John 1:9). Have Faith – “A man is justified by ________ without the deeds of the law” (Romans 3:28). 7. What are the results of salvation? “But as many as received him, to them gave the power to ________ the _______ of God” (John 1:12). “If a man love me, he will ______ my ________: and my Father will love him, and we will come unto him, and _______ our ________ with him” (John 14:23). “Even the Spirit of truth; whom the world cannot receive, because it seeth him not, neither knoweth him: but ye know him; for he _________ with you, and shall be ___ you. (John 14:17). 8. How do I accept this plan of salvation, and what does it symbolize? Therefore we are buried with him by _______ into death: that like as Christ was raised up from the dead by the glory of the Father, even so we also should walk in newness of life (Romans 6:4). “I have espoused you to one husband, that I may present you as a chaste virgin to Christ” (2 Corinthians 11:2). 9. How important is this new birth relationship with Christ? Jesus answered and said unto him, Verily, verily, I say unto thee, _______ a man be born again, he cannot see the kingdom of God. Verily, verily, I say unto thee, _______ a man be born of water and of the Spirit, he cannot enter into the kingdom of God (John 3:3, 5). 10. Would you like to experience this new birth and accept God’s free gift of salvation?